This article is about the former local government area. For the current local government area, see Canterbury-Bankstown Council. For the Sydney suburb, see Bankstown. 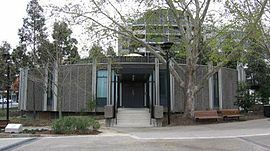 The City of Bankstown was a local government area in the south-west region of Sydney, Australia, centred on the suburb of Bankstown. In 2006, the NSW government released a planning strategy for Metropolitan Sydney, known as the City of Cities plan for Sydney. The plan identified Bankstown as a 'major centre' for the south west Sydney region. Bankstown Airport was also identified as a 'specialist centre' and the Hume Highway as part of a potential transport corridor. Under the most recent Draft Metropolitan Strategy for Sydney released in 2013, the NSW Government has reaffirmed Bankstown as a major centre, and Bankstown Airport as a specialised centre. The last Mayor of the City of Bankstown Council was Clr Khal Asfour, a member of the Labor Party. A 2015 review of local government boundaries by the NSW Government Independent Pricing and Regulatory Tribunal recommended that the City of Bankstown merge with the City of Canterbury to form a new council with an area of 110 square kilometres (42 sq mi) and support a population of approximately 351,000. On 12 May 2016, the NSW Government announced that Bankstown would merge with neighbour City of Canterbury to be known as Canterbury-Bankstown Council. At the 2011 Census, there were 182,352 people in the Bankstown local government area, of these 49.3% were male and 50.7% were female. Aboriginal and Torres Strait Islander people made up 0.8% of the population. The median age of people in the City of Bankstown was 35 years, which is slightly lower than the national median of 37 years. Children aged 0 – 14 years made up 21.7% of the population and people aged 65 years and over made up 13.7% of the population. Of people in the area aged 15 years and over, 52.1% were married and 11.0% were either divorced or separated. Population growth in the City of Bankstown between the 2001 Census and the 2006 Census was 3.43%; and in the subsequent five years to the 2011 Census, population growth was 6.96%. When compared with total population growth of Australia for the same periods, being 5.78% and 8.32% respectively, population growth in Bankstown local government area was approximately 75% of the national average. The median weekly income for residents within the City of Bankstown was slightly lower than the national average. At the 2011 Census, the proportion of residents in the Bankstown local government area who stated their ancestry as Lebanese, was in excess of eight times the national average. The proportion of residents who stated an affiliation with Islam was in excess of eleven times the national average. Meanwhile, as at the Census date, the area was linguistically diverse, with Arabic or Vietnamese languages spoken in 30% of households, both languages approximately seven times the national averages. The water tower, known as Bankstown Reservoir, is a heritage item managed by Sydney Water. In 1826, bush rangers were hanged on the site where the water tower now stands. District of Bankstown was named by Governor Hunter in 1797 in honour of botanist Sir Joseph Banks, who travelled to Australia with Captain James Cook in 1770. The area was discovered during an expedition of the Georges River by George Bass and Matthew Flinders. The area of first European settlement along the river has been partially preserved as part of the Mirrumbeena Regional Reserve. Bankstown also includes large areas of the Georges River National Park. Railway formed an important part of the development of Bankstown. After the extension of the railway from Belmore to Bankstown in the 1890s, rapid development of the area followed – so much so that the commercial centre of Bankstown moved from its former position in Irish Town (Now Yagoona) on Liverpool Road to the vicinity of Bankstown railway station. In March 1895 a petition was submitted to the NSW Colonial Government by 109 residents of the Bankstown area, requesting the establishment of the "Municipal District of Bankstown" under the Municipalities Act, 1867. The petition was subsequently accepted and the Municipal District of Bankstown was proclaimed by Lieutenant Governor Sir Frederick Darley on 7 September 1895. The first six-member council, standing in one at-large constituency, was elected on 4 November 1895. With the passing of the Local Government Act 1906, the council area became known as the Municipality of Bankstown. 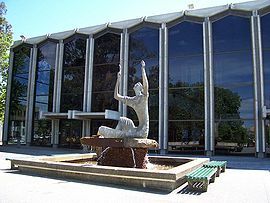 Bankstown's city status was proclaimed in 1980 in the presence of Queen Elizabeth II, becoming the "City of Bankstown". On 12 May 2016, the City of Bankstown was merged with the City of Canterbury to form the Canterbury-Bankstown Council. The Bankstown Bunker was an exact replica of the underground Ops rooms of wartime England, which directed Britain's air defence fighter plane attacks on the invading German Luftwaffe. Entrance to the bunker was obtained through a concrete passageway which was well screened by a grassy slope; a stairway led to a virtual maze of corridors and hallways leading to various sections. There were two points into to the bunker (escape hatches) which were guarded by military police, and access was gained via the bottom level. The former Bankstown City region was approximately 76 square kilometres (29 sq mi) and had a population density of about 21.46 people per hectare. The boundaries of the former Bankstown City were, clockwise, the Prospect water supply pipeline and Liverpool Road (also known as Hume Highway) along the north, Roberts Road, Juno Parade, Koala Road, Punchbowl Road, Canterbury Road and the Salt Pan Creek along the east, the Georges River in the south and the Georges River, Prospect Creek, the Hume Highway and Woodville Road along the west. Salt Pan Creek is a saltmarsh and mangrove swamp that extends from Canterbury Road to Georges River. Paul Keating Park, in the centre of Bankstown, stands on the old site of the Council Administration building, which burned down in an accidental fire in 1997. The Park is used for a variety of concerts and festivals (including the annual Bankstown Christmas Carols), and is otherwise a large playing field. Nowadays, all of the Council operations are contained in the Civic Tower, adjacent to the Park. Bankstown Town Hall faces opposite. The three-storey complex of Central Bankstown Library, opened in 1983. Bankstown had 293 parks covering 730 hectares (1,800 acres) within its city limits. There are 41 sports grounds, 12 community parks and 18 natural parklands. In the CBD, major parks include Bankstown Oval, McLeod Reserve, Paul Keating Park and Bankstown City Gardens. Other major parks include Mirambeena Regional Park, The Crest, Middleton Park, O'Neill Park, Terry Lamb Complex, Garrison Point, Jensen Oval and the extensive parklands around Georges River, among others. The entrance to Georges River National Park is also located within the city. Broken Hill, a city in remote New South Wales. Bankstown signed its first Sister City Agreement with Broken Hill on 16 September 1986. Suita, Osaka, Japan. Bankstown signed its first international Sister City agreement with Suita City, Japan, in March 1989. Colorado Springs, Colorado, United States. Colorado students in Bankstown signed a new Sister City Agreement with Colorado Springs, home of the United States Olympic Committee, on 13 July 2001. Yangcheon-gu City, Seoul, South Korea. In 1997, Bankstown signed a Friendship Agreement with Yangcheon-gu City in South Korea, resulting in the establishment of youth exchanges and the sharing of information between both local authorities. During a tour in 2001, Bankstown Council delegates met with Korean officials to discuss ways of promoting Bankstown companies with a view to creating new export markets. The Cities exchanged details of Management Planning Processes and inspections of community facilities took place in Yangcheon. A Sister City Agreement was subsequently signed with Yangcheon City in September 2002. Shijiazhuang, Hebei, China. In February 2000 a friendship agreement was made between Shijiazhuang City and Bankstown. The friendship agreement signifies that the two cities are exploring the possibility of venturing into a sister city agreement. ^ a b c d e Australian Bureau of Statistics (30 June 2012). "2011 Census QuickStats: Bankstown (C)". Retrieved 26 June 2012. ^ Historical Tour of the Bankstown District (5th ed.). Bankstown Historical Society. 1991. ^ a b Rosen, Sue (1996). Bankstown, a Sense of Identity. ^ "About Bankstown – Yesterday & Today". Bankstown City Council. Archived from the original on 22 June 2005. ^ "Merger proposal: Bankstown City Council, Canterbury City Council" (PDF). Government of New South Wales. January 2016. p. 7. Retrieved 28 February 2016. ^ a b Australian Bureau of Statistics (9 March 2006). "Bankstown (C)". 2001 Census QuickStats. Retrieved 12 November 2012. ^ a b Australian Bureau of Statistics (25 October 2007). "Bankstown (C)". 2006 Census QuickStats. Retrieved 12 November 2012. ^ a b "Bankstown City Council – East Ward". Local Government Elections 2012. Electoral Commission of New South Wales. 14 September 2012. Retrieved 21 September 2012. ^ a b "Bankstown City Council – North Ward". Local Government Elections 2012. Electoral Commission of New South Wales. 14 September 2012. Retrieved 21 September 2012. ^ a b "Bankstown City Council – South Ward". Local Government Elections 2012. Electoral Commission of New South Wales. 14 September 2012. Retrieved 21 September 2012. ^ a b "Bankstown City Council – West Ward". Local Government Elections 2012. Electoral Commission of New South Wales. 14 September 2012. Retrieved 21 September 2012. ^ Vidler, Adam (25 September 2012). "ALP split over Bankstown Council mayoral deal". The Canterbury Bankstown Express. Retrieved 13 October 2013. ^ "BANKSTOWN.—PETITION FOR A MUNICIPALITY". New South Wales Government Gazette (203). 23 March 1895. p. 2021. Retrieved 19 November 2016 – via National Library of Australia. ^ "Government Gazette Proclamations and Legislation". New South Wales Government Gazette (603). 9 September 1895. p. 5823. Retrieved 19 November 2016 – via National Library of Australia. ^ "MUNICIPAL DISTRICT OF BANKSTOWN". New South Wales Government Gazette (742). 8 November 1895. p. 7231. Retrieved 19 November 2016 – via National Library of Australia. ^ "Development Over Time". Bankstown City Council. Archived from the original on 29 August 2007. Retrieved 20 July 2007. ^ Lawrence, Joan; Madden, Brian; Muir, Lesley (September 1999). Pictorial History of Canterbury Bankstown. Kingsclear Books. p. 124. ISBN 0-908272-55-3. Retrieved 4 October 2013. ^ "Community Profile – Summary." Retrieved on 29 July 2007. ^ "MUNICIPALITY OF BANKSTOWN". New South Wales Government Gazette (822). 10 December 1895. p. 8004. Retrieved 19 November 2016 – via National Library of Australia. ^ "Bankstown's New Mayor". The Cumberland Free Press. 1 (52). New South Wales. 13 June 1896. p. 4. Retrieved 19 November 2016 – via National Library of Australia. ^ "MUNICIPAL DISTRICT OF BANKSTOWN". New South Wales Government Gazette (160). 21 February 1899. p. 1499. Retrieved 19 November 2016 – via National Library of Australia. ^ "MUNICIPAL DISTRICT OF BANKSTOWN". New South Wales Government Gazette (153). 20 February 1900. p. 1452. Retrieved 19 November 2016 – via National Library of Australia. ^ "MUNICIPAL DISTRICT OF BANKSTOWN". Government Gazette of the State of New South Wales (89). 17 February 1903. p. 1442. Retrieved 19 November 2016 – via National Library of Australia. ^ "MUNICIPAL DISTRICT OF BANKSTOWN". Government Gazette of the State of New South Wales (94). 21 February 1905. p. 1239. Retrieved 19 November 2016 – via National Library of Australia. ^ "THE COUNCIL OF THE MUNICIPALITY OF BANKSTOWN". Government Gazette of the State of New South Wales (24). 26 February 1908. p. 1270. Retrieved 19 November 2016 – via National Library of Australia. ^ "MUNICIPALITY OF BANKSTOWN". Government Gazette of the State of New South Wales (24). 24 February 1909. p. 1235. Retrieved 19 November 2016 – via National Library of Australia. ^ "Bankstown. Alderman Bransgrove Elected". The Cumberland Argus and Fruitgrowers' Advocate. XXIII (1790). New South Wales. 11 February 1911. p. 11. Retrieved 19 November 2016 – via National Library of Australia. ^ "THE COUNCIL OF THE MUNICIPALITY OF BANKSTOWN". Government Gazette of the State of New South Wales (22). 12 February 1913. p. 1035. Retrieved 19 November 2016 – via National Library of Australia. ^ "BANKSTOWN". The Sydney Morning Herald (23, 581). 8 August 1913. p. 6. Retrieved 19 November 2016 – via National Library of Australia. ^ Stewart, Tony (15 September 1999). "Tribute To Phil Lopez, OBE" (Hansard). Legislative Assembly. Parliament of New South Wales. Retrieved 14 February 2017. ^ Brookes, Glenn (21 February 2013). "Tribute to Max Parker" (Hansard). Legislative Assembly. Parliament of New South Wales. Retrieved 14 February 2017. ^ a b c d "Bankstown's Sister Cities" (PDF). Bankstown City Council. Archived from the original (PDF) on 29 August 2007. Retrieved 20 July 2007. ^ "Shijiazhuang friendship agreement". Bankstown City Council. Archived from the original on 6 August 2008. Retrieved 9 January 2010. This page was last edited on 14 December 2018, at 03:22 (UTC).